Every once in a while, something appears in the sky that attracts the attention of even those who normally don’t bother looking up. It’s likely to be that way on Saturday (July 5), when the waxing gibbous moon — 58 percent illuminated and just past first quarter phase — will appear in very close proximity to Mars. People who are unaware or have no advance notice will almost certainly wonder, as they cast a casual glance toward the moon on this night, just what is that orange-yellow "star" hovering just above it? As a bonus, from the central Pacific Ocean, Hawaii, western portions of Central America and the northern half of South America, the moon will appear to hide or eclipse Mars for a short time. The actual term is "occultation" (Latin for "hiding"). An opportunity to see the moon occult a bright planet does not happen often, so if you are fortunate enough to live in the occultation zone and the weather gods cooperate, this upcoming event is one that really should not be missed. For this lunar rendezvous, Mars will shine at magnitude +0.1. This is a comedown from last April, when Mars was much closer to Earth and appeared more than four times brighter. And yet Mars still ranks as one of the brightest objects of the early summer evening sky, just a trifle fainter than the bluish star Vega and the orange star Arcturus. Don’t miss this near miss! 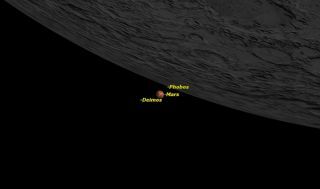 For much of North America, this will be a very close approach of the moon to Mars (called a conjunction). From the eastern half of the United States and Canada, the closest approach will take place after sunset. Even though most of North America will miss out on an occultation, Mars will almost command people to look at it, as it slowly appears to glide above the moon. The table below provides the specific details for 15 selected cities. The above table, which I calculated exclusively for Space.com, gives civil times (all p.m.) of Mars’s closest approach to the edge of the moon’s upper limb. An asterisk (*) Indicates that closest approach actually occurs before sunset, in a daytime sky; for such cases, the closest approach is given as coinciding with sunset when Mars might be discerned against the bright twilight sky with the naked eye or with binoculars. Separation between Mars and the moon’s upper edge is given in terms of minutes of arc (the apparent width of the moon on July 5 is 31 arc minutes) and the percentage of the apparent width of the moon. A value of 0.65, for example is equal to 65 percent of the moon’s width. Here are some examples. From Houston, closest approach between Mars and the moon is at 8:25 p.m. Central Daylight Time, the separation is 9 arc minutes or 0.29, which is less than one-third of a moon’s width from Mars to the upper edge of the moon. From New York, closest approach is at 9:52 p.m. Eastern Daylight Time, the separation is listed at 20 arc minutes or 0.65, which means fractionally, slightly less than two-thirds of the moon’s width will separate Mars from the moon’s upper edge.